J-Jaz is an online jewelry store with a focus on luxury and designer quality. Template Studio has been commissioned to create a fresh new site to reflect the style and glamour of their brand, and to provide a confident, reassuring shopping environment for their customers. We believe our design will help J-Jaz to establish a strong brand identity synonymous with style and luxury. 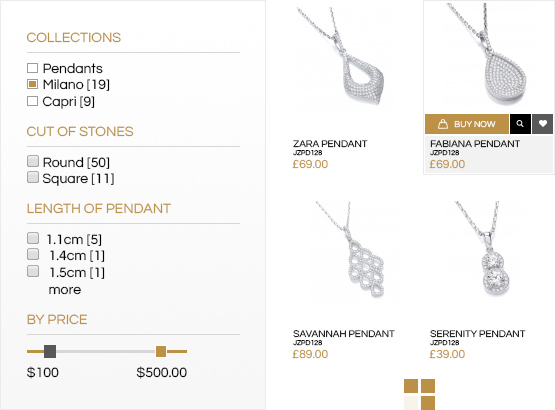 Template Studio has worked closely with J-Jaz to make sure that our new site design complements and reinforces the exquisite style of their jewelry, chic gift boxes and designer bags. A wealth of product attributes enables customers to easily identify and compare items, build a favorites list and find something to meet their particular taste and budget. Template Studio offers a complete web programing service, enabling our clients to specify their own, custom features unique to their site. For J-Jaz we have designed a custom product loading module, an advanced filter column and a user friendly one-stop checkout.